This week (13th May 2014) Jua Jimbo project (Know Your County) mobilisers and members of the Youth Model Assembly - a coalition of youth led grassroots organizations in the counties, mandated by communities from four electoral wards in Machakos County to debate community led public issues, that formulates motions and find suitable solutions by virtue of incorporating the views and opinions of the voice poor. The Model assembly has also got the responsibility of creating linkage with the county government of Machakos - had the opportunity of paying a courtesy call to the office of Clerk. We are received by the Machakos County Assembly Deputy Senior Clerk Mr. Mathew Mwange and together with his able team we are ushered into the Machakos County Assembly Chambers, as we are ushered into the chambers; my eye catches the court of arms of the County Government of Machakos as well as the People of Machakos. I quickly notice the emblems are those of crossing swords and a bow. Upon seeking interpretation of the emblems from my colleague the County Speaker of the Jua Jimbo Sponsored Youth Model Assembly Mr. Dickson Muli, I come to understand that the emblems symbolizes the responsibility of the house to protect the interests of her people at all cost in a collaborative framework as mandated by the constitution. 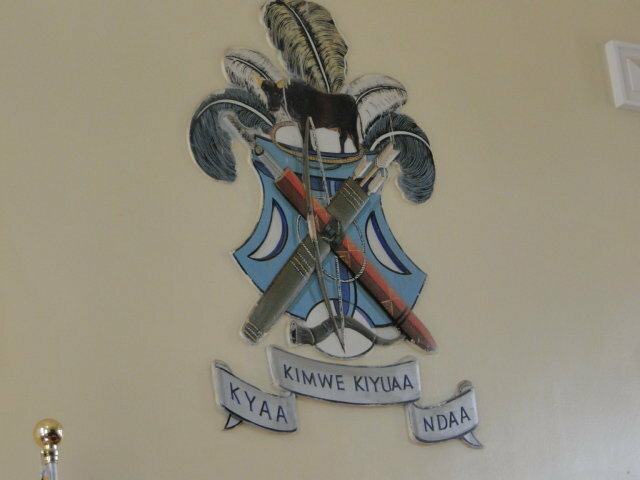 Inscribed on the court of arms are four Kamba words Kyaa Kimwe Kiyuaa Ndaa. I later on come to learn that its means one finger does not kill a tick!It then hits me that indeed these words elaborate the spirit of the supreme constitution that upholds the intent of Community participation in all public processes. Over the years, Kenya has progressively shifted from a centralized to a decentralized form of governance. This paradigm shift was precipitated by the shortfalls that are often characteristic of highly centralized systems. The shortfalls include administrative bureaucracies and inefficiencies, misappropriation of public resources and the marginalization of local communities in development processes. Consequently in the late 1990s, the government began the devolvement of specific funds and decision making authority to the districts, local authority and constituency levels (Legal Resources Foundation Trust, 2009). The Kenyan Constitution provides a strong legal foundation for the enhancement of participatory governance through devolved structures at county level. Article 6 (2), states that the governments at the national and county levels are distinct and inter-dependent and shall conduct their mutual relations on the basis of consultation and cooperation. Article 174, further lays out the objects of devolution are to (c) give powers of self-governance to the people and enhance their participation in the exercise of the powers of the State and in making decisions affecting them (d) recognize the rights of communities to manage their own affairs and to further their development. There are two broad dimensions of citizen participation namely, indirect involvement and direct involvement. Indirect involvement acknowledges that electoral officials and professional administrators should act on behalf of the citizens in a representative democracy. Direct involvement suggests that citizens are the owners of the government and should be involved in the decisions of the State. This dimension is administrative centric. This simply means that it focuses on the role of the public in the process of administrative decision-making or their involvement in decision-making related to service delivery. It thus implies governmental efforts to involve citizens in administrative decision making and management processes. Since it occurs primarily at the administrative-citizen interface direct participation therefore differs from political participation. The latter includes but is not limited to voting in elections, contacting elected officials and campaigning for political candidates. Community participation continues to evoke the spirit of the Kenyan Constitutionalism, and the reference of the Kenyan citizens as the real owners of our republic. The Kenyan constitution under the clause of community participation, gives an opportunity to the common citizen to be at the centre of the decision making process with regards to community projects, decentralization of public services, devolved funds and resources and most importantly the responsibility of the elected leaders to represent the views of the citizen in legislative organs of the National Assembly, the Senate and the 47 county assemblies. While paying a courtesy call to the Office of the Governor of Machakos County, Boniface Manyala, a Senior Communications expert in the County Government of Machakos puts it plainly, “If the community are not involved in any of the government’s agenda, then it simply did not happen and has no value being reported or publicized.” Manyala acknowledges that in a community process there will always be dissenting views in national building, strategy or project approach but in the same stride, walking with the community together to create a level ground for implementation of projects which in essence ends up instilling a sense of ownership of public processes and projects. Jua Jimbo Project (Know your County) aims at creating awareness and empower communities access information from public institutions, ask pertinent questions regarding utilization of public finances and resources, prioritizing community projects on a need basis based on a consultative process as well as legislation of county/national laws. For the last year, the project has continued to invest in the establishment of the Youth Model Assemblies in Nakuru and Machakos counties, Muungano wa Wanavijiji (Federation of the urban poor) is one of the lead project implementers in the mentioned counties. The Model Assembly is constituted to follow up with county leaders /various actors (state and non-state actors) on issues concerning a variety of communal concerns such as; water, sanitation, Education, bursary allocations, proper expenditure of the Constituency Development Funds and health- all in a bid to find solutions for lack of access to clean water by residents and electricity in the only hospital facility within the area. As such, in March.2014, a meeting with the team tasked to spearhead the process was held in Kinanie and so far, courtesy visits to lobby the Member of the County Assembly -Kinanie to look into the issues have been held and discussions are underway which will pave way for long term solution to challenges facing residents of Kinanie.The other wards also benefiting from the project impacts are Central Ward, Kiima Kimwe and Mavoko. The project has continued to build on an in-depth planning framework with 8 project CSO’s from Machakos County around memos and petitions. 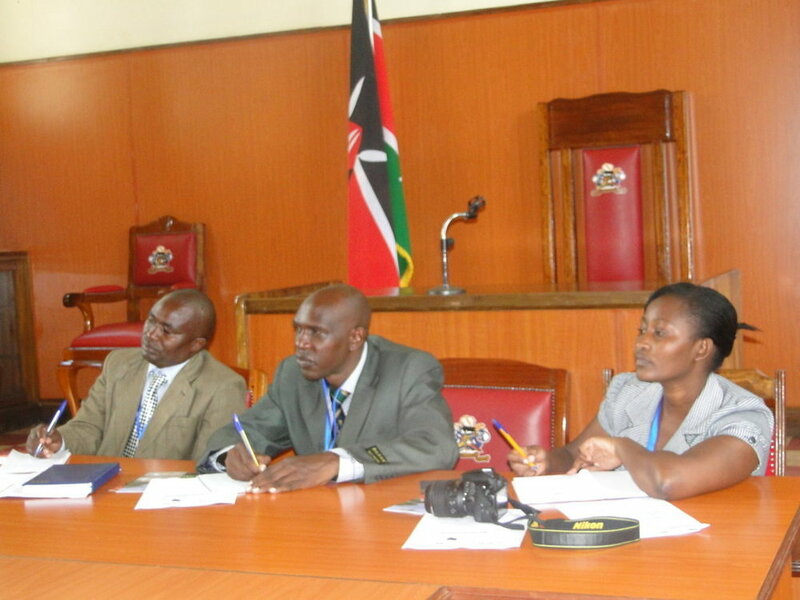 Leaders of the Youth Model Assembly from Machakos County paid a courtesy call of the Machakos County Assembly to negotiate for cordial working relations with the counties’ legislative arm. The meeting provided an opportune moment for the team to interrogate their progress so far at both project and community level and how to improve on delivery as detailed; writing of memos on the current state of security and poor state of sanitation/access to clean water in Kiima Kimwe ought to be in progress. Petitions on the low levels of engagement of community members by county leaders in county initiatives especially in Mavoko constituency and lack of electricity/access to water ought to be developed incase meetings with respective actors fail to produce expected results. An in-depth look at the YMA mode with the support of the Machakos County Assembly Deputy Speaker Mr. Mathew Mwange, the first Clerk Assistant Mr. Lucas Mainge and the Public Relations Liaison Officer Cynthia Wacuka accorded the team an insight on how best the model assembly can build on its systems for purposes of improving delivery on their mandate to urban and rural communities. In Machakos county, the capacity to lobby and advocate by project CSO’s continue to be demonstrated in the initiatives identified and prioritized so far across all the 4 wards. Engagement with both local and county leaders around issues affecting community members continue to be exemplified as in the case of Kinanie motors and Mjini women who in this period have widely made consultations with county leaders with regards to service delivery on prioritized community issues. The young women leaders from Mavoko have also taken up the initiative to meet the Mavoko area members of Parliament to lobby for space of women in development issues within the area which is a significant milestone.